ePublishing Knowledge BaseePublishing Knowledge BaseePublishing Knowledge Base Creating Image Galleries, Videos, Podcasts, and Downloadable FilesHow do I create an image gallery / photo gallery? Create a new image gallery. Upload images to the gallery. Delete images in your gallery. Edit images in your gallery. Change the order of images in your gallery. 1. 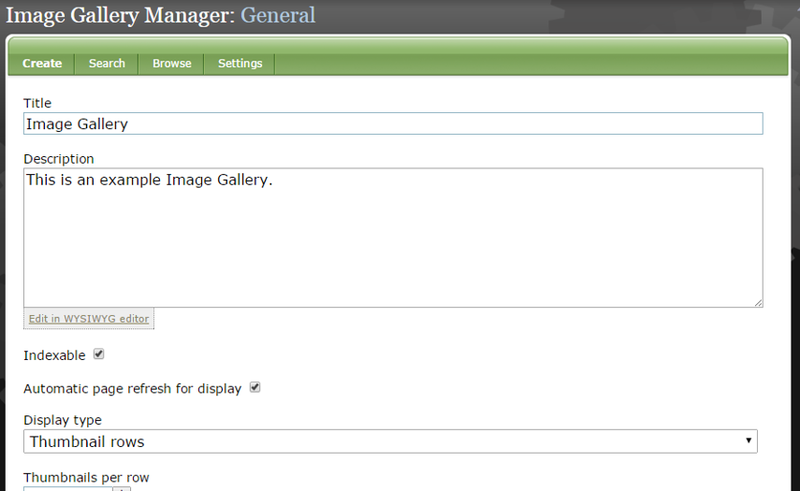 Access the Image Gallery Manager under Editorial on your Dashboard. To create a new Image Gallery, click Create. To edit an existing Image Gallery, click Search & Edit, Browse or Edit by ID to access. To adjust the default settings of your Image Galleries, click Settings to access Viewing width and height, as well as Thumbnail width and height. 2. Title your Image Gallery and add a description. Zoom: Title your Image Gallery and add a description. Your Image Gallery will default to Indexable (searchable on your website) and Automatic page refresh for display. 3. Next, select how you would like your Image Gallery to be displayed. Zoom: Next, select how you would like your Image Gallery to be displayed. 4. And how many images per row in the display. Zoom: And how many images per row in the display. 5.1. 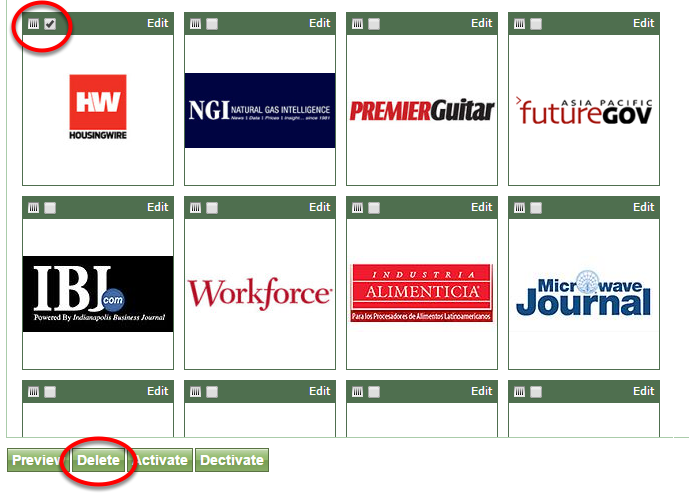 Select Browse, and create a Parent Directory within the Media Manager. Upload all images to that directory and then add that Parent directory. 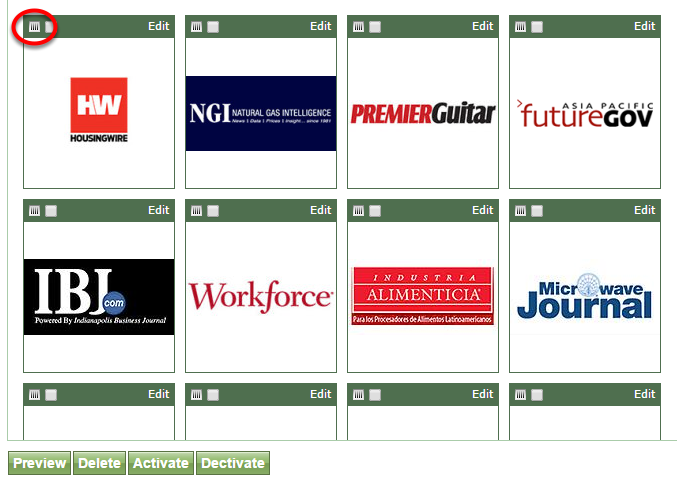 Zoom: Select Browse, and create a Parent Directory within the Media Manager. Upload all images to that directory and then add that Parent directory. 5.2. Or upload a Zip folder from your computer with the images you'd like to include. Zoom: Or upload a Zip folder from your computer with the images you'd like to include. 6. 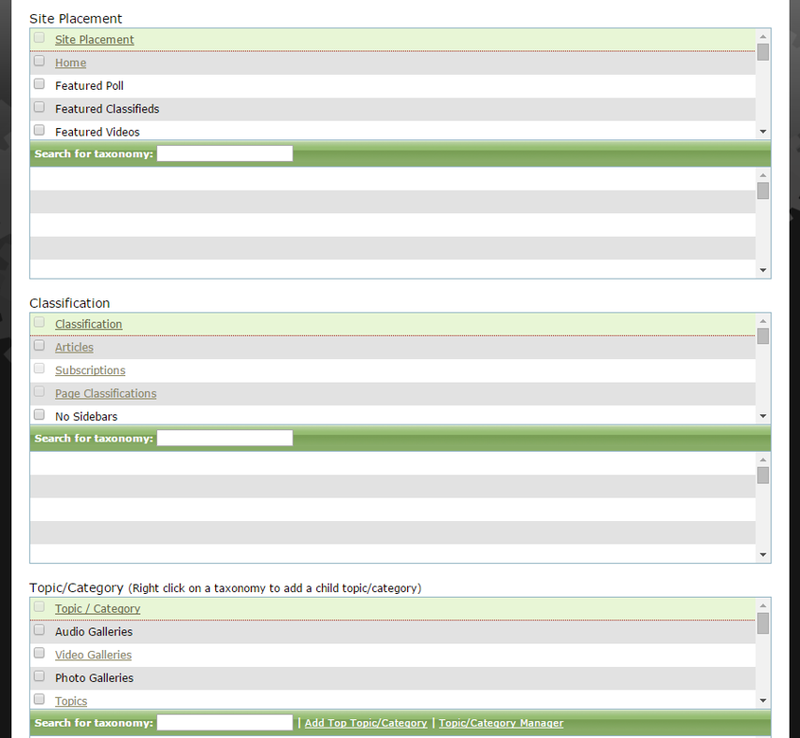 Assign site placement and taxonomy topics/categories. Zoom: Assign site placement and taxonomy topics/categories. Each website's taxonomy is unique. If you have questions about your website's taxonomy, please reach out to your ePublishing's solutions manager. 8. To view your gallery within the Image Gallery Manager tool, under Edit, click View. 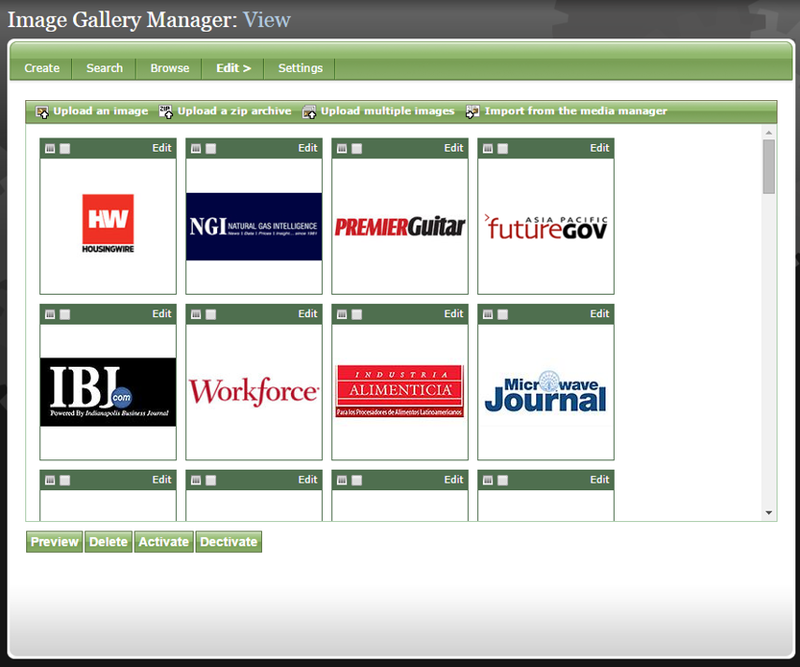 Zoom: To view your gallery within the Image Gallery Manager tool, under Edit, click View. 9. From the View page, access the existing images and add new ones. Zoom: From the View page, access the existing images and add new ones. 9.1. Option 1: Upload an image. When you click Upload an Image, you will see an expanded view. You may upload a new image by clicking Choose File (1). Add a Title (required), Alt. Text and other properties for your image. 9.2. Or select Upload a Zip Archive, which will allow you to add a set of images in a Zipped folder from your computer. Zoom: Or select Upload a Zip Archive, which will allow you to add a set of images in a Zipped folder from your computer. 9.3. Upload Multiple Images is another way of adding several images to your gallery at once. Zoom: Upload Multiple Images is another way of adding several images to your gallery at once. After choosing your file, click Add next to the Choose File icon. When finished adding images, click the green Import button. 9.4. 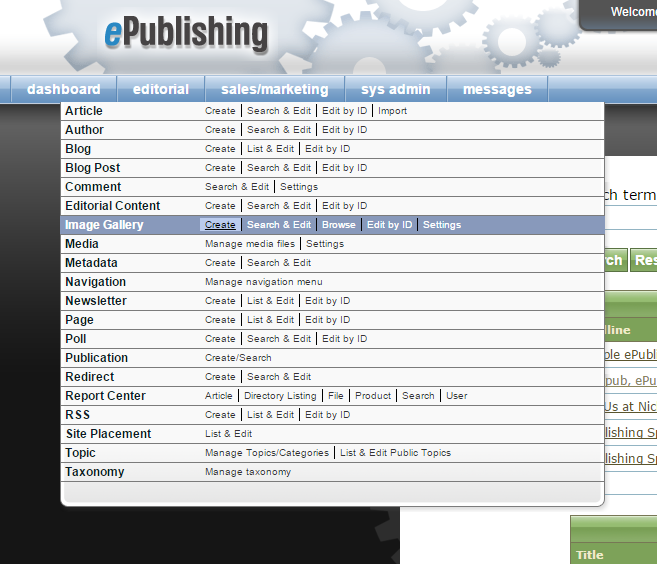 And finally, add images by clicking Import from the Media Manager, which will take you to your ePublishing Media Manager. Zoom: And finally, add images by clicking Import from the Media Manager, which will take you to your ePublishing Media Manager. 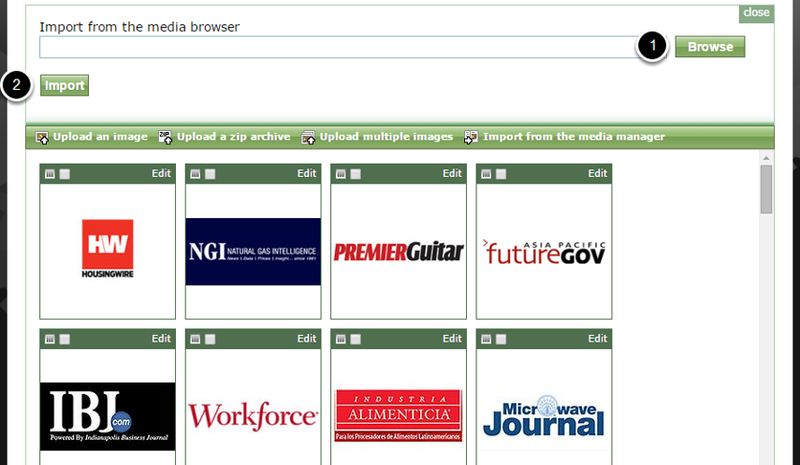 To add images from your Media Manager, click Browse and select an image. When you are finished, click Import. 10. To remove an image from the gallery, select the box above the image, and click Delete below. 11. To change the order of the images in the gallery, click and hold down on the box in the top left of the image (circled) and drag. 12. Add Related Content to appear next to your Image Gallery under Edit > Related. Zoom: Add Related Content to appear next to your Image Gallery under Edit &gt; Related. Please note that every website is different, and where related content appears is dependent on your website's design. Learn more about associated Related Content here: How do I select related articles, blog posts, listings, events, products and more to appear next to my content? 13. When you are finished creating or updating your Image Gallery, it's time to publish your gallery. Return to the General edit page. Zoom: When you are finished creating or updating your Image Gallery, it's time to publish your gallery. Return to the General edit page. Prev: How do I upload new media, such as photos, videos and files? 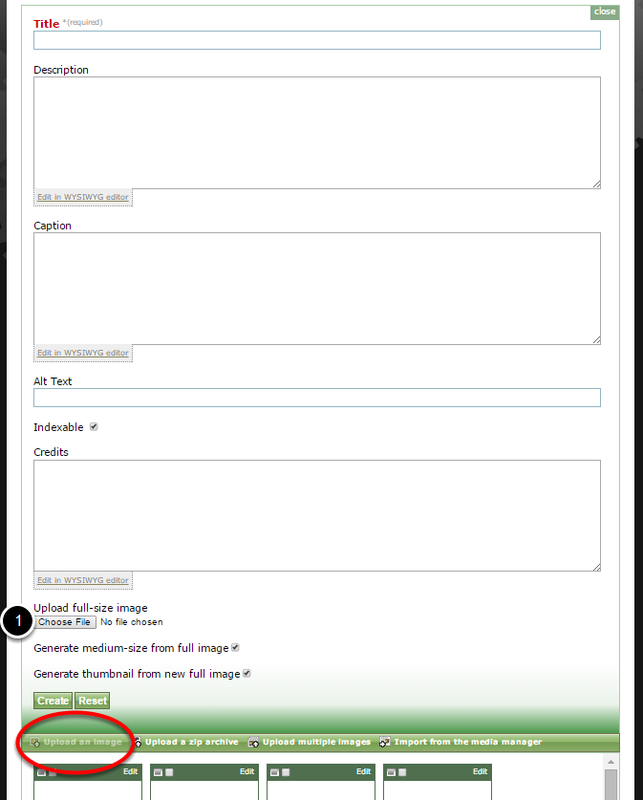 Next: How do I upload multiple images at the same time to the Media Manager?